Coco review by a girl who usually hates Disney movies. I don’t hate Disney movies, but I might as well since I never get excited enough for one to actually pay to see it in theaters. Don’t fight me please, thank you! That is why I wanted to talk about the Disney movie Coco since I watched it last week and had some emotions lol no I didn’t cry, but it was still a Disney movie I would re-watch again and again. I saw Coco with my aunt and grandma here in Mexico (I’m in Mexico until February btw lol) I didn’t have subtitles and it was in Spanish so some parts I was clueless about but it was still enjoyable and easy to understand for me. I didn’t cry but I wanted to at the parts where they sang. I have never seen an animated movie that got this big, that has brown characters and who are singing in Spanish. Maybe Book of Life was like that, but I haven’t seen it, but I will! 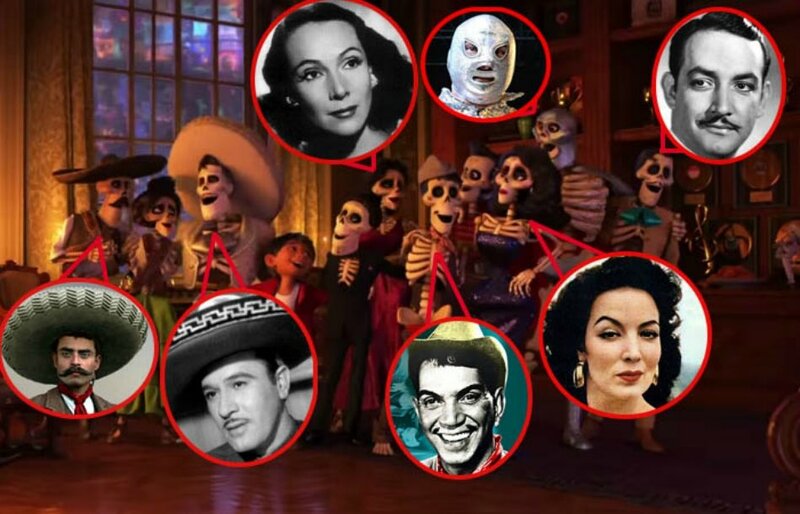 My family probably doesn’t understand how great a movie like Coco is since they’re not really aware of the lack of representation on their T.V. Sometimes I ask why there so many white Latinx or white passing latinx on Mexican tv. The only times I see dark skinned Mexicans is when they’re showing disasters or tragedies and poverty like when the earthquakes happened this September. If you were a victim or your family was, I’m very sorry that you had to go through all that torture. It was a very big deal for you guys that don’t know much about it. People I follow on Tumblr who I know live in the places effected are taking time off social media because they have hallucinations, hear people dying and screaming and I can’t even imagine what that’s like. I’m sorry and I hope the government is doing something to help. Honestly I don’t understand Spanish that well so I’m not sure if anything is being done to help those affected. This movie is about Dia de Los Muertos and this mexican family where the boy wants to be a famous singer/guitarist. This movie really pulls your heartstrings because death is something everyone has to deal with some time in their life. You have a pet die, grandparent, sister, cousin, uncle mom and dad… so everyone who watches can kind of relate even of its a story about Mexican culture. For being Mexican, I really don’t know much about this tradition. Lots of Mexicans don’t know, not even my mom or grandma. My grandma tells me this is a tradition done by many but not everyone who is of Mexican heritage, including my mom, granda and great grandma lol. None of my friends celebrate it either so I guess it’s just certain parts of Central America, I believe, and parts of Mexico. Coco was amazing and beautiful and something I haven’t seen before. I loved the singing the most out of this. You could tell the Spanish version was not originally in Spanish. I focused so much by looking at the mouth movements, and I think this movie was originally in English. I recommend anyone to watch it but if you love sentimental movies, Disney, learning about cultures, singing and pretty colors, then you definitely need to watch it! I’m very happy I didn’t cry because my Mexican family is so heartless lol if they saw me cry they would would make fun of me or something. Miguel is a Mexican and African American singer. Here he is with Natalia Lafourcade for a song in Coco. I don’t remember hearing it but it could have been in the credits? Anyways, it’s on spotify too, in case you wanna put it in your playlist! This is a song(audio only) from the Spanish version, I thought this scene was so cute. Please watch the Spanish version with subs (if it’s still in theaters lol) it is so amazing. I heard that you have to sit through a 20 minute short of Olaf or something if you watch it in English so yeah, I had to avoid that.